I just love pretty nails! I love them so much that my toe nails haven't been unpainted since I was a kid. I love pedicures too. But looking back, the only times I've gotten pedicures is for my wedding and the three times I was 9 months preggo and ready to pop! Besides those few wonderful, blissful times, I've always done my nails at home. 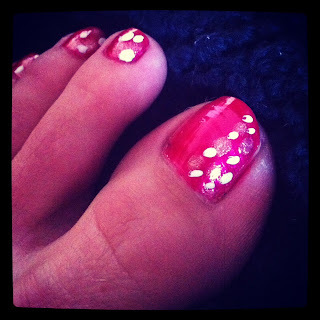 Recently I came across a couple of blogs that talk a lot about doing pretty nails at home! My favorite is The Beauty Department! I lo-OVE it! I could read it for hours, getting all kinds of pretty inspiration! Anyway, I was in need of a toenail change, so I thought I'd see what I had and what I could come up with! Simple right?! 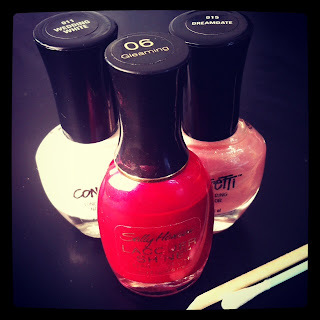 Three nail polishes: a darkish pink, a light pink and a white! I also used the little sharp wooden stick thing. Do those have a name?! And a Q-tip! You can use really whatever you have at home for your dots! This is just what I happened to have! Step 1: Paint your toenails the base color, in this case the dark pink! Step 2: Use your Q-tip to make some light pink dots. You can either pour out some light pink polish and dip the Q-tip into that, or just dip your Q-tip into the bottle, which is what I did! I also only did dots on one side of my nail. Just for fun! Step 3: Use the pointy stick thing to make some smaller white dots. Again, pour it out or just dip in the bottle! Step 4: Let dry and then cover with a Top Coat sealer! Step 5: This step is a must! Wear pretty flip flops and show off your cool new toes!